The original Super Monkey Ball was an App Store launch game and sold like gangbusters. Taking advantage of the iPhone’s accelerometer controls and already possessing a huge following thanks to its console success, Super Monkey Ball was one of the most highly anticipated apps on the iPhone. The only problem was: it wasn’t very good. Difficult controls and unimpressive 2-D graphics limited a game that by all accounts had much promise. But Super Monkey Ball 2 not only intends to improve upon the original, but to live up to the considerable potential of the popular monkey-rolling franchise. I sat down with Sega’s associate creative director Ethan Einhorn to discuss this new game for the iPhone. Slated for a Holiday 2009 launch date, Sega hasn't announced yet what this game will cost. There are over one hundred new boards to steer your monkey ball around, over, and through. The graphics have been given a complete overhaul, finally bringing fully 3-D balls and boards to the iPhone. The zones have different stylistic themes to provide plenty of eye candy to players—I got to play several jungle stages and then a later industrial-style level. There are also fifteen additional bonus boards to unlock and three mini games to enjoy. The first, Monkey Bowling, will be available at launch. It’s a simple bowling game, but it’s somehow more satisfying when you see your monkeys stumble around after being knocked senseless by the pins. Two additional minigames—Monkey Golf and Monkey Target—will become available thanks to a free update in 2010. The controls have also been much improved. 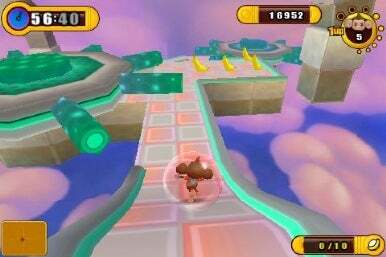 I got to demo both the original Super Monkey Ball for the iPhone and the sequel and the difference between the two was like driving a tricycle with square wheels compared to a well-greased ten-speed. While the original had oversensitive controls and a tendency to cause the player to roll backwards, the new version was intuitive to pick up and the tutorial was a breeze to get through. Though it’s too early to give a full review, based on the time I spent with the game, Super Monkey Ball 2 looks to have beautifully fluid controls—easy to pick up but still providing enough challenge to make gameplay fun. If only players could enjoy this kind of gameplay when the App Store first launched. But perhaps the most exciting new feature of Super Monkey Ball 2 is the addition of multiplayer. You can challenge up to three friends at a time across various boards. Multiplayer is limited to WiFi at this point, but during the demo I got to challenge the developers and some fellow journalists in several head to head matches and was surprised by how smoothly the game ran. Of course connection speeds will vary, but there was no slowdown or frame rate drop when all four of us were competing in some tightly contested races (which, thankfully, I won a few of). Keep your monkey-loving eyes open for a full review when the game launches for the App Store this Holiday Season.